Segal’s Ed Colgate and Michael Peshkin have done it again! Recently the two were featured in Northwestern Engineering, McCormick’s magazine, making the cover story for their newest success: The TPad. 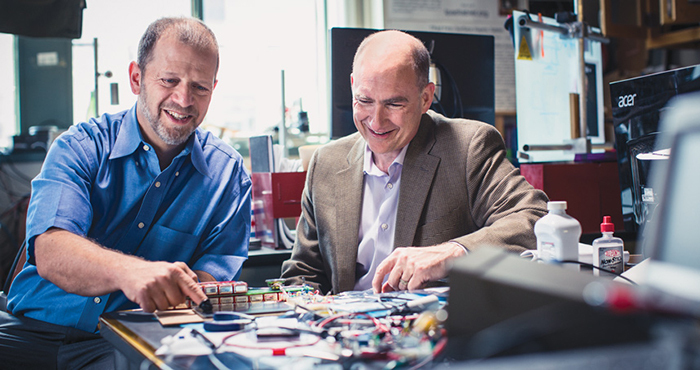 The TPad incorporates haptics technology, a field in which Colgate and Peshkin are pioneers. “Haptics” originates from the Greek word “haptikos,” which means “to touch.” And that’s exactly what makes the TPad revolutionary. At first the TPad may seem like your average smartphone. However, this smartphone allows you to feel what you are seeing on the screen. With a specialized case that incorporates haptics technology, the touchscreen can feel sticky, slippery, bumpy or wavy – and can also create an “edge” effect for the user as they slide their finger across the surface. The TPad is available to commercial retailers and researchers for purchase through Tanvas, one of three companies Colgate and Peshkin have started together. Read the full article to learn more about the TPad, and Colgate and Peshkin’s 27-yearlong partnership.